Monday, July 15 marked the end of the Colts 42-day-long summer tour. Seven Tailgate Tours and three Fan Fests gave Colts fans the opportunity to get closer to their favorite NFL team. From Ft. Wayne in northern Indiana to Evansville in southern Indiana, and even to Louisville, Ky., the 12-member promotions staff traveled nearly 1,900 miles. 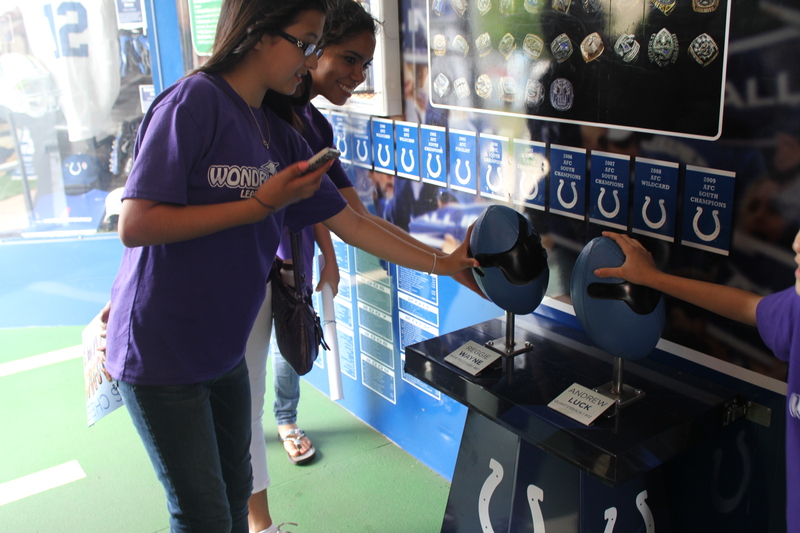 The Colts Tailgate Tour and Fan Fest sponsors helped make these events as successful as they could by providing giveaways, such as mini-footballs and tote bags, and by helping promote these events locally. The summer tours were sponsored by American Family Insurance, Indiana Corn Marketing Council and Indiana Soybean Alliance. Other visiting Colts sponsors included AAA Motor Club, College Choice 529, Direct Buy, Fair Oaks Farms, Harrison College, IU Health, Lewis Bakeries, MainGate, National Guard, Sun Tan City and Vincennes University. As the ten events of the summer tour come to a close, the Colts look back at all of the memorable Tailgate Tours and Fan Fests with the 6,000 fans that they met along the way. 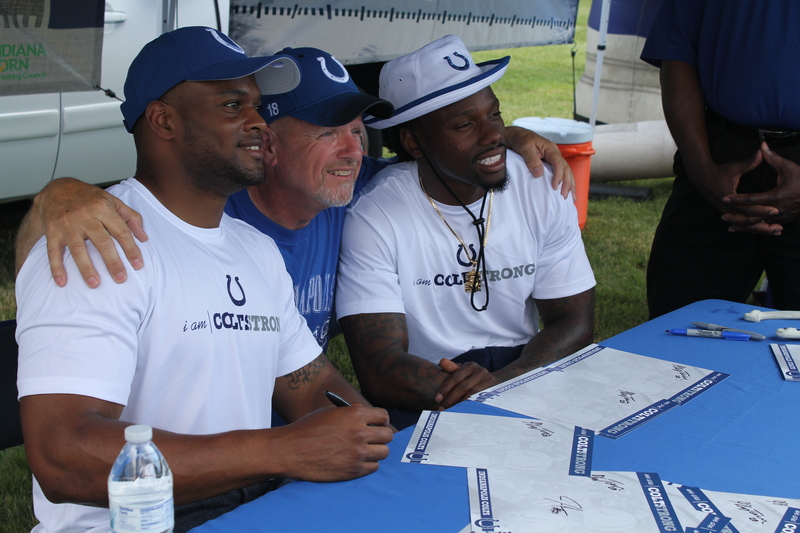 The Colts kicked off the 2013 summer tour right Tuesday, June 4, spending time with the dedicated Colts fans in Columbus, Ind. Ricky Jean Francois and Lawrence Sidbury signed autographs for the hundreds of fans that came to Harrison College that day. Next, the Colts traveled to a local AAA Motor Club location in Kokomo, Ind. Hundreds of fans received autographs from Dwayne Allen, Chandler Harnish and the Colts cheerleaders, and then walked through Colts In Motion to learn more about their favorite team. Staying close to home on Thursday, June 13, the Colts held their third Tailgate Tour at IU Health Saxony Campus in Fishers, Ind. Jean Francois and Sidbury were a returning duo at the autograph table. The windy weather made the inflatable quarterback challenge a struggle to stay grounded for the fans to test their skills. Tuesday, June 18, the Colts ventured to a AAA Motor Club location in Terre Haute for another two-hour Tailgate Tour. Due to a pop-up thunderstorm, the event was cut an hour short. The Colts promotions team bonded while tearing down the event in the rain. 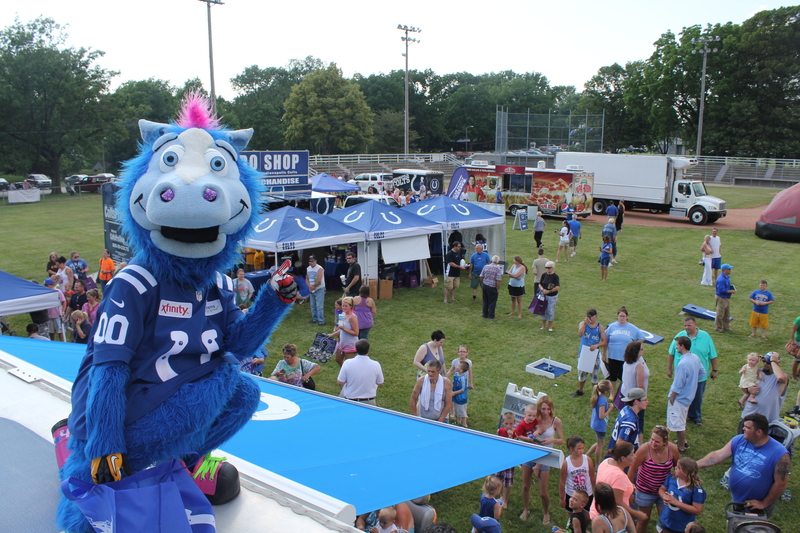 The Colts first and one of the most popular Fan Fests of the summer was held in Milligan Park in Crawfordsville, Ind. Nearly 1,000 fans waited in a long, winding line Thursday, June 20 to get into Baldwin Memorial baseball field for autographs, inflatables and the Hunter Smith Band. Next up, Tuesday, June 25 was another Tailgate Tour stop, this time, hosted at Vincennes University. Colts tight end Dwayne Allen made his second appearance of the summer with guard Joe Reitz to meet all of the Vincennes Colts fans. Reitz, a Hamilton Southeastern High School graduate, proved to be a highlight of the summer tour. Traveling to one of Indiana’s neighboring states Thursday, June 27, the Colts brought their second Fan Fest to Louisville, Ky. Fans walked around wearing their new COLTSTRONG bracelets listening to the country sounds of the Hunter Smith Band. Making his third appearance, Dwayne Allen came with teammate Coby Fleener via helicopter to the riverside location in Waterfront Park. “I don’t mind signing a lot of autographs after playing for Clemson. We used to sit out there [signing autographs] for four hours!” Dwayne Allen remembered about his college years playing for Clemson University. To fully celebrate the Fourth of July, the Colts Tailgate Tours and Fan Fests took a week-long vacation from traveling. The next week, the Colts promotions team was ready to get back on the road to meet more Colts fans across the state of Indiana. 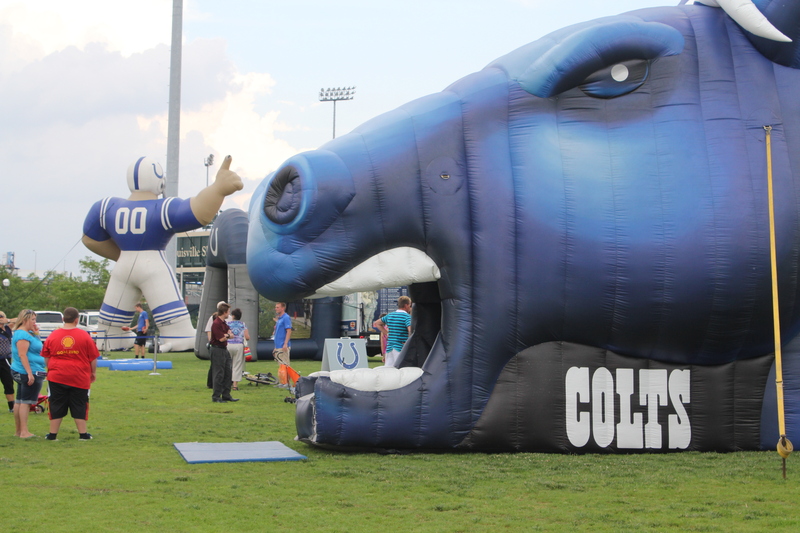 The Colts had planned on going all out at the Fair Oaks Tailgate Tour Wednesday, July 10 with all of the kid-friendly inflatables; however, the weather had plans of its own that day. A severe thunderstorm moved the fun, community event inside, and the autographs began. Donald Thomas and Anthony Castonzo met hundreds of young fans, making some of their dreams come true. The final Fan Fest of the summer was July 12 at the Three Rivers Festival in Ft. Wayne. Thomas and Castonzo returned and got the full “fair experience,” enjoying elephant ears, pulled pork sandwiches and corndogs from the festivals’ “Junk Food Alley” after they finished signing nearly 800 autographs. The longest trip of the summer was a 370-mile, 7-hour roundtrip to Evansville for the final Tailgate Tour. Dwayne Allen returned for a fourth and final time with Jerrell Freeman to sign footballs, helmets, posters and purses at Harrison College. Traveling to the outskirts of Indiana, and even to Kentucky, was just as memorable to the Colts as it was to the fans. The live music, autographs, giveaways and inflatables allowed the Colts to meet the most important people on the team – the fans. Since we can’t have ALL of our fans at each home game in Indianapolis, we’re happy to bring the COLTSTRONG experience to them. It has become more easy to send cash today than previously. Delivering money online is a quick and simple procedure that often leads to cash arriving immediately also. Lots of people want to understand how to online money transfer to Italy. The growth of Smartphones previously few years is incredible. Phone in the event that you are reading this article. Virtually all sectors are affected by this growth. going back home after work.